میربهاء, بابک, عبدالرزاقی, علیرضا. (1397). مدلسازی رفتار رانندگان در انتخاب عبور یا توقف در ابتدای فاز قرمز در تقاطع‌های چراغ‌دار (مطالعه موردی :شهر قزوین). جاده, 26(97), 145-154. بابک میربهاء; علیرضا عبدالرزاقی. "مدلسازی رفتار رانندگان در انتخاب عبور یا توقف در ابتدای فاز قرمز در تقاطع‌های چراغ‌دار (مطالعه موردی :شهر قزوین)". جاده, 26, 97, 1397, 145-154. میربهاء, بابک, عبدالرزاقی, علیرضا. (1397). 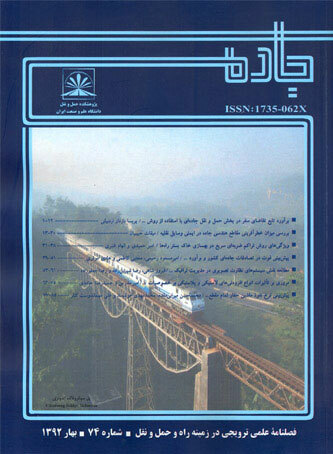 'مدلسازی رفتار رانندگان در انتخاب عبور یا توقف در ابتدای فاز قرمز در تقاطع‌های چراغ‌دار (مطالعه موردی :شهر قزوین)', جاده, 26(97), pp. 145-154. میربهاء, بابک, عبدالرزاقی, علیرضا. مدلسازی رفتار رانندگان در انتخاب عبور یا توقف در ابتدای فاز قرمز در تقاطع‌های چراغ‌دار (مطالعه موردی :شهر قزوین). جاده, 1397; 26(97): 145-154. عبور از چراغ قرمز یک عمل بسیار خطرناک رانندگی است.که کاهش این رفتار مخاطره آمیز بستگی به درک شیوع آن و همچنین عوامل تأثیرگذار بر این رفتار دارد. با این هدف در این مطالعه پس از برداشت داده­های واقعی ازچهار تقاطع چراغدار شهرقزوین با استفاده از دوربین های نظارت تصویری و نرم­افزار چراغ های هوشمند مرکزی در دو زمان اوج و غیر اوج ترافیک و شرایط جوی بارانی و آفتابی نسبت به تحلیل ریسک­پذیری رانندگان از تقاطع در فاز قرمز بااستفاده از مدل لوجیت باینری اقدام شد. معمولاً عبور از چراغ قرمز امری تعمدی نمی باشد، به طور کلی طبق مشاهدات انجام گرفته 96 درصد متخلفان در 2 ثانیه ابتدایی از فاز قرمز چراغ اقدام به عبور کردند. همچنین نتایج بدست آمده از مدل­، حاکی از آن است که وجودعابرپیاده در سواره رو، فاصله خودرو از خط ایست در ابتدای فاز زرد و مدت زمان سپری شده از فاز قرمز مهم ترین عوامل تأثیرگذار برتوقف رانندگان در فاز قرمزاست. همین­طور افزایش سرعت خودرو مهمترین عامل تأثیرگذار برعبور رانندگان در فاز قرمز است. همچنین اگر فاصله خودرو در هنگام زرد شدن چراغ راهنمایی بیش از 20 متر باشد احتمال عبور از چراغ برای خودرو صفر می­گردد و اگر خودرو در فاصله9 متری از تقاطع قرار داشته باشد ومتغیر های دیگر در متوسط میزان خود باشند به احتمال 51 درصد خودور تخلف می کند. Bolduc, D. and Ben-AkiWand, M. (1996), “Multinomial Probit with a Logit Kernel and a General Parametric Specification of the Covariatice Structure”, Massachusetts Institute of Technology: Cambridge Mass. -Bonneson, J. (2003), “­Institute of Transportation Engineers, Making Intersections Safer: A Toolbox of Engineering Countermeasures to Reduce Red–Light Running: An Informational Report”, Washington DC. -Bonneson, J., Brewer, M., & Zimmerman, K. (2001), “Review and evaluation of factors that affect the frequency of red-light-running”, No. FHWA/TX-02/4027-1. -Bonneson, J., & Son, H. (2003), “Prediction of expected red-light-running frequency at urban intersections”. Transportation Research Record: Journal of the Transportation Research Board (1830), 38-47. -Caird, J. K., Chisholm, S., Edwards, C. J. and Creaser, J. I. (2007), “The effect of yellow light onset time on older and younger drivers’ perception response time (PRT) and intersection behavior”, Transportation Research Part F: Traffic Psychology and Behaviour, Vol.10, No. 5, pp. 383-396. -El-Shawarby, I., Rakha, H. A., Inman, V. W., & Davis, G. W. (2007), “Age and gender impact on driver behavior at the onset of a yellow phase on high-speed signalized intersection approaches”, Paper presented at the Transportation Research Board 86th Annual Meeting. -Elmitiny, N., Yan, X., Radwan, E., Russo, C., & Nashar, D. (2010), “Classification analysis of driver's stop/go decision and red-light running violation”, Accident Analysis & Prevention, Vol.42, No. 1, pp. 101-111. -FHWA, (2009), “Engineering Countermeasures to Reduce Red-Light Running”, FHWA-SA-10-005, Washington, D.C.
-Gates, T. and Noyce, D., (2010) “Dilemma zone driver behavior as a function of vehicle type, time of day, and platooning”, Transportation Research Record: Journal of the Transportation Research Board, No. 2149, pp. 84-93. -Gates, T., Noyce, D., Laracuente, L., & Nordheim, E. (2007), “­ Analysis of driver behavior in dilemma zones at signalized intersections”, Transportation Research Record: Journal of the Transportation Research Board, No.2030, pp. 29-39. -Gonzalez, F. E. B., & Figueroa Medina, A. M. (2012), Red Light Running Behavior at Signalized Intersections in Puerto Rico. No. 12-3095. -Haque, M. M., Ohlhauser, A. D., Washington, S. and Boyle, L. N. (2016) “Decisions and actions of distracted drivers at the onset of yellow lights”, Accident Analysis & Prevention, Vol.96, pp. 290-299. -Hensher, D. A., Rose, J. M. and Greene, W. H. (2005) “Applied choice analysis: a primer”, New York: Cambridge University Press. -Huang, M., Fujita, M. and Wisetjindawat, W. (2017) “Countdown timers, video surveillance and drivers’ stop/go behavior: Winter versus summer”, Accident Analysis & Prevention, Vol.98, pp. 185-197. -Hurwitz, D. S., Knodler Jr, M. A., & Nyquist, B. (2010), “Evaluation of driver behavior in type II dilemma zones at high-speed signalized intersections”, Journal of Transportation Engineering, Vol.137, No. 4, pp. 277-286. -Kim, S., Son, Y.-J., Chiu, Y.-C., Jeffers, M. A. B., & Yang, C. D. (2015), “Impact of road environment on drivers’ behaviors in dilemma zone: Application of agent-based simulation”, Accident Analysis & Prevention. -Konecni, V., Ebbeson, E. B. and Konecni, D. K., (1976), “Decision processes and risk taking in traffic: Driver response to the onset of yellow light”, Journal of Applied Psychology, Vol61, N. 3, pp.359. -Lemeshow, S., & Hosmer, D. W. (1982), “A review of goodness of fit statistics for use in the development of logistic regression models”, American journal of epidemiology, Vol.115, No. 1, pp. 92-106. -Liu, H. X., Wu, X., Ma, W., & Hu, H. (2009), “Real-time queue length estimation for congested signalized intersections”, Transportation Research Part C: Emerging Technologies, Vol.17, No. ), pp. 412-427. -Long, K., Han, L. D., and Yang, Q. (2011), “Effects of countdown timers on driver behavior after the yellow onset at Chinese intersections”, Traffic injury prevention, Vol.12, No. 5, pp. 538-544. -NHTSA, (2008a) “Traffic Safety Facts 2008 Report”(<http://www.nrd.nhtsa.dot.gov/Pubs/811170.PDF>Accessed 30 July 2012). -NHTSA, (2008b) “Fatality Analysis Reporting system. -NHTSA, (2004), “The National Survey of Speeding and Other Unsafe Driver Actions”, Vol. 2: Findings. Report No. DOT HS 809 730. -Retting, R. A., Williams, A. F., Farmer, C. M. and Feldman, A. F. (1999), “Evaluation of red light camera enforcement in Oxnard”, Accident Analysis & Prevention, Vol.31, No. 3, pp. 169-174. -Savolainen, P. T. (2016), “Examining driver behavior at the onset of yellow in a traffic simulator environment: comparisons between random parameters and latent class logit model”, Accident Analysis & Prevention, Vol. 96, pp. 300-307. -Setti, J. R., Rakha, H. A. and El-Shawarby, I. (2006), “Analysis of brake perception-reaction times on high-speed signalized intersection approaches”, Paper presented at the 2006 IEEE intelligent transportation systems conference. -Sharma, A., Burnett, N. and Bullock, D. M. (2010), “Impact of inclement weather on dilemma zone boundaries”, Paper presented at the Transportation Research Board 89th Annual Meeting. -Wang, X., Yu, R., & Zhong, C. (2016), “A field investigation of red-light-running in Shanghai, China”, Transportation Research Part F: Traffic Psychology and Behavior, Vol. 37, pp.144-153.